A general purpose immersion sensor with grounded junction for fast response. Stainless steel sheath. For use with Marlin Model HP-X or HP-R probe extension. Displays parameter item and setpoint. 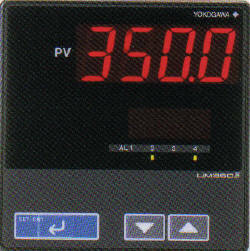 Displays measured input value (PV) and error code in error occurrence. Alarm Indicator lamps (AL1 to AL4).